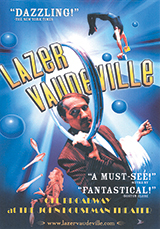 Lazer Vaudeville combines the traditional arts of vaudeville--juggling, comedy, slapstick acrobatics --with the modern special effects of lasers, strobe, and black-light illusion. In this DVD, which features their full-length show, the 3-person troupe--Carter Brown, Cindy Marvel and Nicholas Flair perform numerous juggling routines: club juggling and passing, ball juggling and bouncing, hoop rolling, trick roping, percussive bolas, cigar boxes, boomeranging hats, indoor stunt kites, lighted staff twirling and chainsaw juggling. 90 min. performance, an additional 20 min. of documentary extras (performer interviews & behind the scenes), plus a photo gallery.